Sayge and Tate are full silicone kits introduced in June 2018. The kits are very soft silicone and therefore very flexible. PLEASE SCROLL ALL THE WAY DOWN TO SEE ALL THE INFORMATION AND LOTS OF PICTURES. There are no more kits available, the kits are SOLD OUT pending a couple payments. A little about Tate and Sayge. There was a hurricane last year at the end of September, Irma passed through South Florida and as a consequence we lost power for a few weeks. While waiting for the power to return my husband asked me to sculpt him a kit. 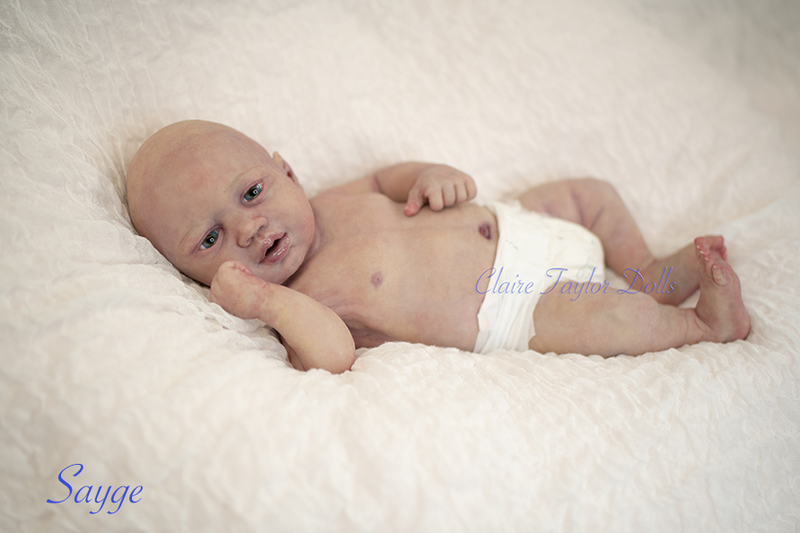 My husband does all the molding and pouring for Claire Taylor Dolls. He had been after me to do a kit for a while but I was just too busy, I told him the same thing, I am just too busy to produce a kit and he promised to do everything for the production of the kits, this is his project. Well, we have been very busy but now we are ready to introduce the kits, yes two of them because when I was finished sculpting one, the power had not returned and I sculpted another head and when the power was back we had two heads and a body. Sayge and Tate will be limited editions of 15 kits each, 15 of Sayge and 15 of Tate. 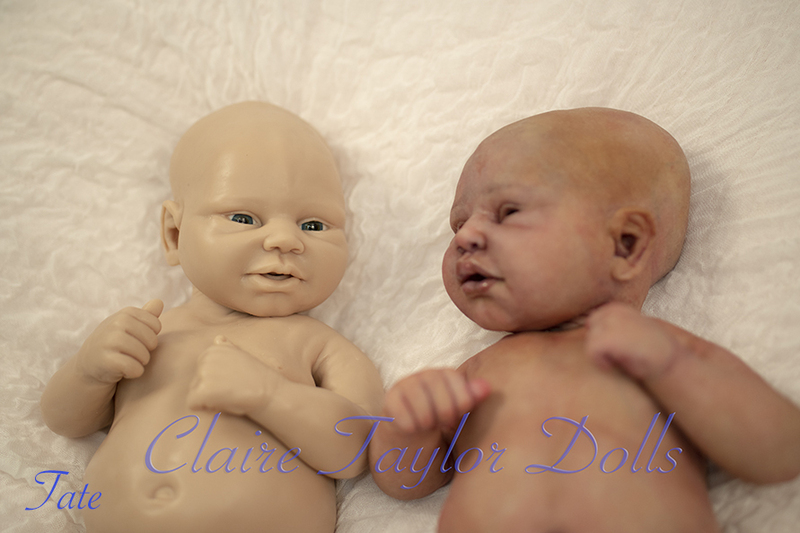 The dolls are just shy of approximately 9lbs, I sculpted chubby babies this time as per my husbands request. I really love these chubby guys, most of my kids were between 6-8 lbs but I did have one that was a little chubbier and he could not fit newborn outfits at birth because he was so big. 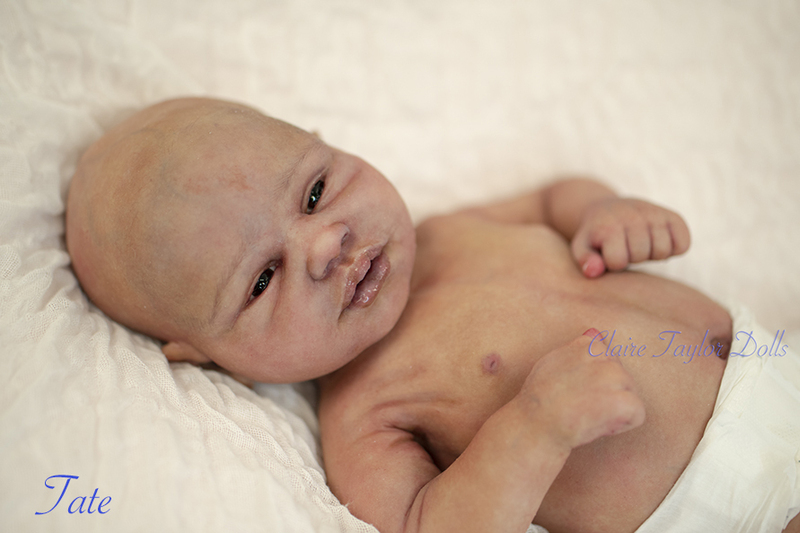 These babies remind me of him. They are 19.5" form head to the tips of the toes with their legs bent, 20" from head to heel with their legs extended. Sayge has a head circumference of 15" and Tate has a head circumference of 14". 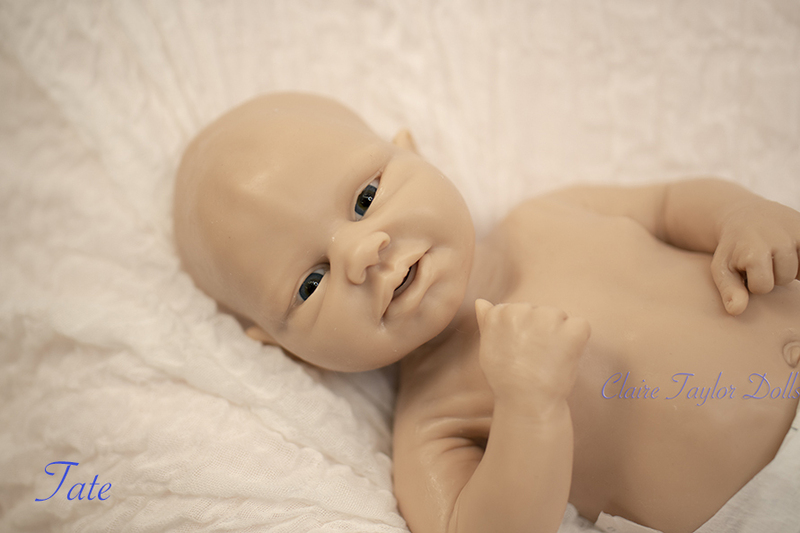 The dolls are in one piece and have a a soft neck that can turn enough so the baby does not look smothered when placed on her tummy because their neck turns to the side. The kits will be $2100 USD plus shipping including the eyes. There will only be three options available full armatures, $500, elbow armatures, $300, and a drink and wet system, $500. The drink and wet will not be visible in any way when looking at the doll. 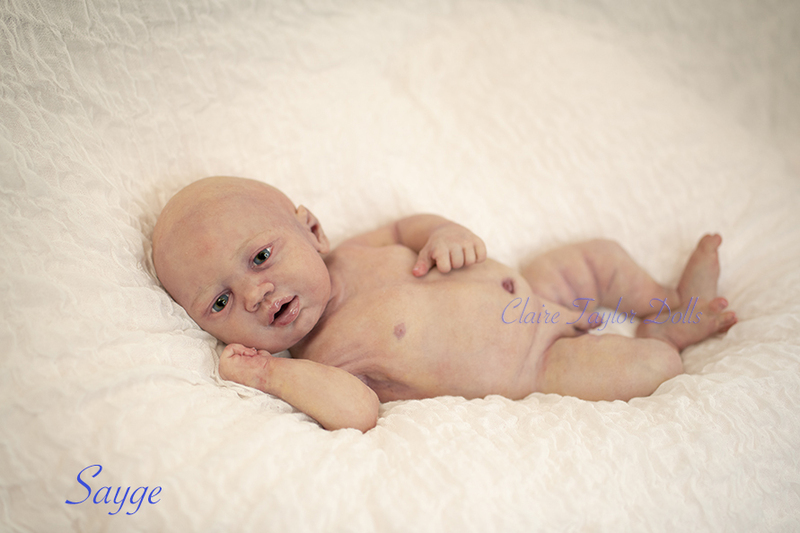 The dolls will also be available in both genders, your choice as boys and girls, the two kits showed in the video and picture are available, they are ready to be shipped, for the rest of the edition To order your kit send an email to saygeandtatekit@clairetaylordolls.com This project will be handled completely by my husband, he does all the pouring and molding here, I will have nothing to do with the project, I am only the sculpting artist for this edition, he is producing the edition. The painted dolls are not available because they are not rooted as yet. I will decide how to make them available when I finish rooting them. We are offering lay away up to 6 months for orders. Lay away will be up to 6 months. When you put a kit on lay away, it will be scheduled to be ready in 6 months from the date of when the lay away started. However, if you pay off the kit ahead of time the kit it will be ready in about 3-4 weeks after the kit is paid off because when you pay early, the kit has to be rescheduled to be ready for the earlier date and how soon it can be ready depends how busy the schedule is when you pay off before the scheduled time. The eyes will be pre-set before shipping. The eyes will available in blue or brown. Sayge has a head circumference of 15"
Tate has a head circumference of 14". Base price $2100 plus shipping calculated based on your location.